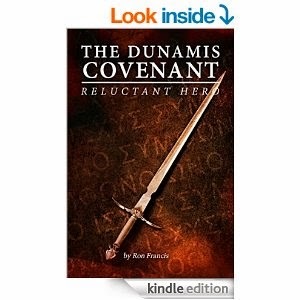 Reluctant Hero (The Dunamis Covenant Book 1) by Ron Francis. Thomas has been living his life with no knowledge of his true destiny, until a chance encounter with Abby, a beautiful woman with a mysterious past. Shortly after meeting her, he finds out he's part of a secret race of powerful people that has stayed hidden in humanity's shadow. While continuing to learn more about himself and his heritage, he is chased halfway across the country. On the run, and separated from Abby, he no longer knows who he can trust. All the while discovering a power inside him he doesn't understand, and never knew he had. The story follows Thomas, a young man, who abruptly finds his life turned upside down. Thomas is part of a secret race and he's the focus of a prophecy. As urban fantasy goes this is the run-of-the-mill stuff, the type of story in which you can predict the ending from the first chapter. Characters were all fairly generic and not one really stood out in terms of uniqueness. The plot was riddled with cliches, dialogue felt choppy and some of the sentences were disjointed. But, saying that, the story did provide me with a feel good factor, and sometimes you want to read a book that you can cheer on the goodies and boo the baddies. This is an ideal book for youngsters. If you're looking for something original and more mature then this book is not for you. © Fantasy Muse 2013. All Rights Reserved. Simple theme. Powered by Blogger.